A funeral should be as unique and special as the person it represents. More and more families are realizing the importance of creating a personalized tribute that celebrates an individual's life, loves, and special moments. There are many meaningful ways to remember someone you love. 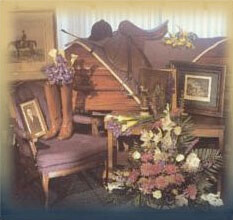 The following are just a few suggestions that can help us personalize the funeral for you. 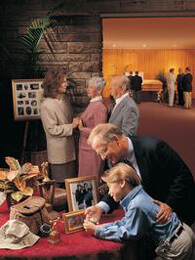 You may of course think of several other unique ways to bring out the life of the person who has died into the funeral or memorial service. If so, please bring them to our attention and we will make every effort to see to it that your wishes are met. And remember, by having a funeral and reflecting on a life that has been lived, you guarantee that everyone your loved one ever said hello to will have a chance to say good bye! Write a letter to the person who has died and express all of the feelings you ever wanted to say, but were afraid to or just never got around to expressing. Seal the letter in an envelope and place it in the casket. Your written thoughts will go with your loved one to his or her final resting place. Bring in photographs spanning the life of the person who has died and we will display them at the visitation and funeral service. These can be photos with family, friends at work, fishing or hunting, golfing, knitting, baking, serious and comical. No photo is in bad taste when it depicts the life of the one you are commemorating. If your loved one had a hobby of building things or was involved in the arts, crafts or photography, bring some of their works in to be displayed at the funeral home. We can even take quilt work and drape it over the casket. If you have favorite scripture readings, let us know what they are and we will see to it that they are incorporated into the service. If the person who died was not a regular church goer, consider having the funeral in a favorite place that perhaps reflected their lifestyle like a favorite park, or a basketball court. The possibilities are numerous. Place cherished items in the casket like pictures of the grandchildren and other family members, a photo of the family pet, a favorite golf club, a pool stick, a well worn baseball cap, or a religious item. We welcome all of them as your way of saying good bye. 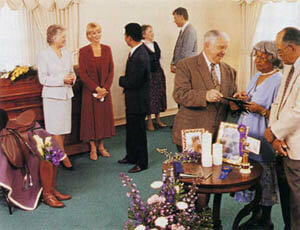 Keep in mind that a funeral or memorial service can take place almost anywhere, at any time. From a traditional setting to a favorite indoor or outdoor location, you can choose the option that best reflects your family's beliefs and the life or interests of your loved one. There are also many meaningful ways to pay ongoing tribute to a friend or family member. Lasting keepsakes such as engraved golf balls or copies of a poem can be given to guests at a service as a memento to honor a special life. In addition, a special tribute in the form of a donation or a permanent memorial can help create enduring and important reminders of the person you loved. Whether you are planning a service for someone close to you, or are interested in pre-planning for yourself, we are here to assist you in creating a personal and loving tribute that will celebrate a life lived and serve as a source of inspiration and comfort to those left behind. We are here to help. If a question arises, do not hesitate to call on us. Someone is always available to answer any questions or concerns you may have. We can be reached in Louisville 478-625-7761 in Gibson 706-598-2301 and in Waynesboro 1-706-551-5100 at any time of day or night or feel free to stop by the funeral home, ask questions, and get acquainted.